The Journal of the American Medical Association reported on a CDC report that showed of the seven essential steps to heart health only 1.2% of American adults adhere to all. 5 of the 7 metrics listed in this report are directly related to levels of physical activity and can be improved with the TrekDesk. A recent study from the Centers for Disease Control (CDC) reported in this month’s Journal of the American Medical Association found that of the seven essential metrics connected to cardiovascular health only 1.2% of American adults met established guidelines. This figure was down from 2% previously established in 1994. 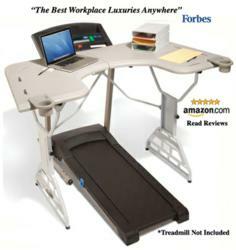 TrekDesk Treadmill Desks offer a unique solution to meet a majority of these heart healthy guidelines. The CDC report stated that cardiovascular disease is still the leading cause of death in the U.S accounting for approximately one third of annual mortalities with an estimated overall cost of $444 billion. About TrekDesk: Designed to fit any existing treadmill, TrekDesk treadmill desk is an affordable, full sized, height adjustable workstation that allows individuals the opportunity to gain the necessary amount of exercise daily to maintain health, prevent disease, strengthen muscles, boost mood and productivity, without requiring additional time during the day or extra motivation. Workout at work with TrekDesk. No sweat!